What is more satisfying than having breakfast in the garden in summer or eating outside in the evening? Apart from a terrace or a lawn, you only need a garden table and garden chairs. smow offers a fine selection of designer garden tables that vary in size, material and shape. 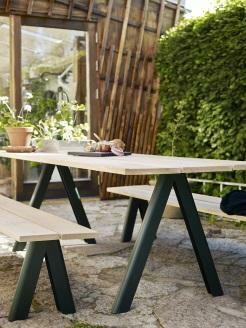 For nature lovers, who also want to accommodate the whole family at the garden table, there are large wooden models, such as the Overlap table from Skagerak . The filigree Baguette Outdoor from Magis is especially classy, ​​the table with the characteristic table top and the graceful legs looks fragile and rustic at the same time, standing firmly on the floor with all four legs. Often in the garden smaller bistro tables with matching chairs are in great demand. An elegant, yet light ensemble is provided by the Vitra Belleville Table Outdoor and the matching Belleville Chair Outdoor. Garden chair and table by the designer brothers Bouroullec bring the French flair in the garden, on the terrace or within your own four walls.